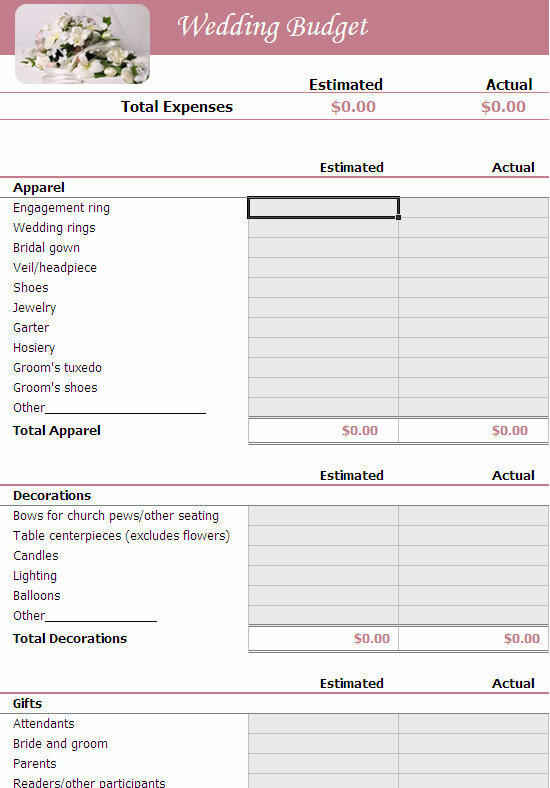 Using Excel templates to maintain a wedding checklist can be very helpful and useful during your planning period. It can help you keep track of all events from the beginning phases to the big moment! Everyone wants a beautiful wedding that flows smoothly from beginning to end. Plans should be started immediately after the proposal to ensure that everything needed is in place. One of the greatest fears of the wedding party is that the day of the wedding will arrive and it will be found that something has been forgotten. It is too late to change things and, although the wedding goes on, the bride knows that all is not as planned. This causes a stress that is unnecessary and avoidable and, at times, ruins the day for the bride and groom. Choose the date and kind of wedding desired. Picking a theme will help pull all the other elements together. Discuss the budget and who will pay what. In today’s economy more and more families are finding that the only way to ensure the couple is thrilled on their wedding day is to share the expense. Have a record keeping system and file for notes and receipts. Tracking what you’ve already done and paid for will help reduce duplication. If possible, contact a Wedding Planner for assistance. The Wedding Planner can take care of part or all of the wedding details and are well-worth the expense. Reserve locations for the wedding and reception. Be sure that the date is definitely booked and you have it in writing. Most venues are booked no less than a year in advance so if you know where you want to have the ceremony as well as the reception, book it before you do anything else. Also check with the sites as they often can provide food, beverages, linens, and other decorations that will save you thousands in the long run. You will probably have to pay a deposit so check in advance how much it will be and have that amount available. Also find out their refund policy. You never know when a disaster, like a broken leg, will occur and you need to postpone. Obtain a marriage license and physical exam, if necessary. This can be done in most states as much as 90 days in advance so make sure you and your fiancé book a date to complete this task otherwise the marriage will not be legal. Contact a minister or other officiate for the wedding date and time you’ve selected and make sure you get a confirmation in writing. You will also need to find out their fee and when that needs to be paid as well. Choose bridesmaids, Maid of Honor, Best Man, Flower Girls (if desired), Ring Bearer (if desired) and confirm acceptance. Make sure they understand your expectations as some will ask to be to serve in an alternative capacity if their schedule will not allow them to support you in the way they would like to. Send an announcement of your impending wedding to the newspaper as well as to friends. Some newspapers have special forms and restrictions as well as fees so be sure and check first so you won’t be disappointed later. Select and register wedding gifts at your favorite store then notify friends and family. This can be done as much as 3 months prior to the wedding in order to give people time to shop as well as get the word out as to where you’re registered. Meet and make arrangements for caterer, musician, baker, florist, and photographer. Make sure you see samples of their work and get references. Don’t be afraid to call the references to get a real feel of the service you’re about to pay for. This is a big financial commitment and you should take this very seriously. Also, shop around. Get three or four offers on each then select the one that best meets your expectations. Make contract agreements for the time and place the service is to be provided in order to avoid misunderstandings. If you decide to hire a caterer be sure to find out if waiters/waitresses are included. Check to see if rental equipment is needed and, if so, make reservations. Be aware that if one has a wedding planner this is taken care of. Select a color theme for the wedding then figure out how to blend it with other colors in order to ensure your pink theme doesn’t make your setting look like a barrel of Pepto Bismol exploded in the room. Select a wedding dress that will enhance your best assets and purchase minimal accessories that will accentuate without overpowering your overall look. Consult with bridesmaids and join them to select and purchase dresses and accessories. This cost is usually covered by the individuals so they will appreciate you keeping their preferences and limitations in mind. Arrange for groom’s attire. Your groom wants to take your breath away as much as you do so set the style then send him with someone you trust to find the perfect attire. Formal wear consultants will assist with selecting the correct apparel whether formal or semi-formal in most tux shops. Selecting the wedding bands are almost as important as selecting the engagement ring. This is the only piece of jewelry the groom will have so make it special and find a set that will tell everyone you belong to each other. You can even have them engraved in order to include a message that will be treasured forever. Order invitations about 6 months in advance as they will be mailed 6 weeks before the wedding day. Programs can be ordered about a month before the ceremony once the order of the nuptials is decided and the songs, readings, etc. have been confirmed. Other additions such as napkins, matchbooks, etc. can also be ordered at the time the invitations are in order to save some money. Make a list of bride and groom’s guests and mail out the invitations 6 weeks prior to the big day. Make sure parents are also consulted to ensure key members of their network circle are also notified. The wedding cake is the focal point of the wedding in addition to you. As such its design and taste should best reflect the two of you as well as your theme. Visit several bakeries and have a taste test. When you find the flavors, design, and price that’s perfect for you go ahead and order wedding cake, but make sure it is not less than 4 weeks in advance in order to accommodate the busy schedule of the bakery. Table favors are your way to remind guests of how much you appreciate their participation in your big day. Whether preparing them yourself (with a scrolled thank you note and bag of candy) or are purchasing something based on your theme (such as a sea shell candy dish for a beach wedding) have them ready to go no less than 2 months before the wedding. This is not something you want to leave to the last minute as they take a lot of time to collect. The groom’s parents usually plan the rehearsal dinner based on the schedule for the rehearsal. Check with the groom’s parents to find out if they have a preferred date for a practice run at the nuptial site. If on a budget, some venues will offer a discount for off days during the week, or the groom’s parents may prefer to have the rehearsal dinner in an alternate setting such as a friend’s backyard. Make sure you check with the nuptial site to secure a date for the rehearsal that corresponds to the groom’s parents’ preferences and let the wedding party know when that will happen. The rehearsal should be conducted either the week prior to the wedding or the week of the wedding in order not to interfere with other planned activities, such as the bachelor and bachelorette parties. A perfect way to thank those who are supporting you is with a bridesmaids’ luncheon. This is the time when thank you gifts are given (usually accessories to match their attendant dresses) and should be a time of fun and relaxation with great food and fabulous desserts. This is their day not yours so make sure they know how much they’re appreciated. This party should be held the week prior to, or during the week of, the wedding. Of course the bridal guides will probably tell you a million more things need to be done, but these are the major ones. If scheduled properly your day will be as perfect as you’ve always dreamed it could be.